Today Samsung announced its latest and greatest phone, the Galaxy Note7, at an event in New York. It isn’t just another extra-large phone from Samsung — the Galaxy Note7 comes with special features like an iris scanner and 12-megapixel camera. The Note7 has an iris scanner that you can use to unlock it. You just hold the phone close to your eyes for it to scan them and authenticate your identity. According to Engadget, it’s easy to set up and use but takes some getting used to. It’s water-resistant like the Galaxy S7 and S7 Edge, but you shouldn’t take it for a long swim. The phone uses a USB-C charging port, a first for Samsung says the Verge. This type of connector has no right way to plug it in, so it’s simpler to use. The S Pen stylus is redesigned to be water-resistant and you can use it to create GIFs. It has a 5.7-inch curved screen, similar to the Galaxy S7 Edge, but less sloping according to CNET. Candyshell Clear, Grip, and Clear with Glitter are ready for the Note7! If you’re planning to pick up the Galaxy Note7, Speck’s got you covered. With military-grade drop protection, CandyShell Clear, CandyShell Clear with Glitter, and CandyShell Grip are ready to keep the Note7 safe. CandyShell Clear, the best­selling case in the U.S.*, shows off the beauty of the Note7 while protecting the phone. Made with a custom­-engineered soft acrylic material that is both tough and transparent, the case resists UV yellowing for long­-lasting clarity. CandyShell Clear with Glitter­ offers ultimate protection and features thousands of pieces of crystal glitter embedded between the inner and outer layers for a shimmering effect that won’t wear off. The iconic rubber ridges on CandyShell Grip provides a no­-slip grip that will keep the phone secure while texting, snapping a photo, or gaming. Each case has a sounds redirect feature that protects the Note7 and adds stability to the case while optimizing sound from the speaker. 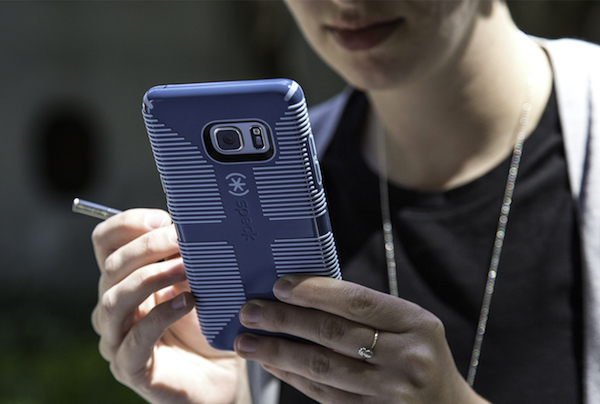 Speck works closely with Samsung when designing our cases to ensure they fit your Samsung device perfectly. With a dual­-layer design, raised bezel screen protection, and responsive button covers, Speck cases always provide the best protection without adding excess bulk. All of Speck’s cases for Samsung Galaxy Note7 are available now on Speck’s website and are coming soon to Best Buy, AT&T, and Verizon stores.